Owerri, the capital of Imo State, Nigeria is no doubt one of the hottest capitals in the country. 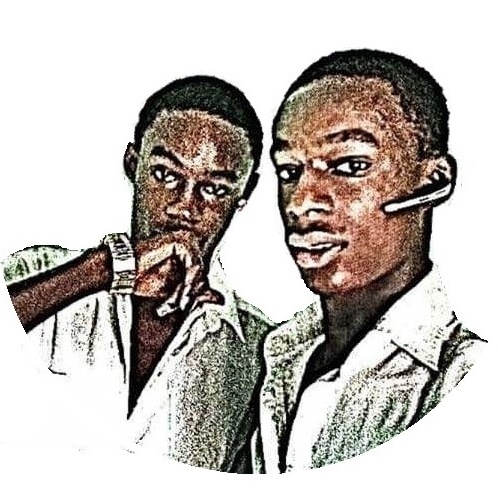 Excluding some other capital cities, such as Lagos and Abuja, which are simply well developed because they're in the sea side, Abuja, which is beautiful as a country's capital, Kano and other business areas, Owerri is well known for its exclusive and outstanding love for pleasure. Every Nigerian actually deserves to pay a trip to this beautiful land, filled with so many hotels, fast foods, clubs, monuments and statutes and so many other things. 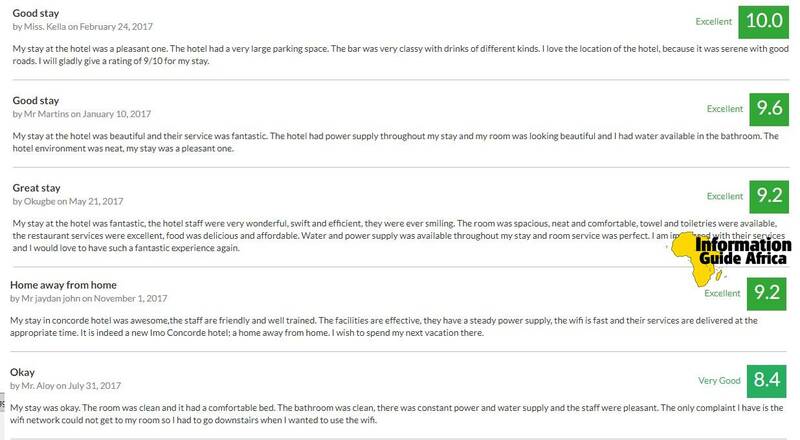 Maybe this is why people are always asking for the list of hotels in Owerri and the Five star hotels in Owerri. Now to start with, there are so many hotels in World Bank Owerri. Moving across the Port Harcourt Road in Owerri, you will also get to see the Immaculate Royal Hotel, Owerri and the Concorde hotel Owerri, Nigeria. The RockView Hotel, Owerri is located very close to the Government House and there are a lot of other 5 star hotels in Owerri. Anywhere you go to in Owerri, you are sure to see hotels. World Bank, Orji, Aladinma, Ikenegbu, Nekedde, Wetheral, Port Harcourt Road and all the other parts of Owerri. It is a very lucrative business and well patronized. Aside the hotels, there are also a lot of fast foods in Owerri. There are brands like Mr Biggs, Kilimanjaro, Rennys, Countrystyle and many others. There also clubs like Curbana and 4040, all together to make your experiens in Owerri a very blissful one. 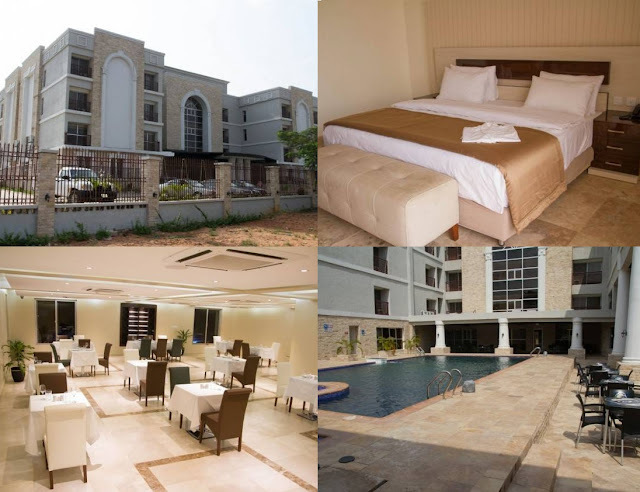 However, we are not talking about all those things today, we are here to discuss the best 10 hotels in Owerri, and you may be shocked to find out they're not actually what you thought they were. Imo Concorde Hotel is sited on the Concorde Boulevard, Off Port Harcourt Road. With about 203 rooms, you can get a perfect choice for a slightly expensive budget. They also have a Night club, Casino, swimming pool, bar, gym, tennis court and 24 hours electricity power supply. All rooms are fully air conditioned, with cable television, mini fridge, high speed internet and computer data porte. The Mirabelle Restaurant at the Imo Concorde Hotel also offer a wide range of local and continental dishes. 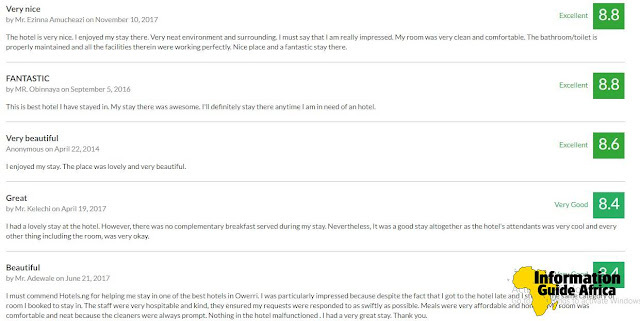 From the Imo Concorde Hotel's reviews, it is probably one of the top hotels in Owerri capital city of Imo State. 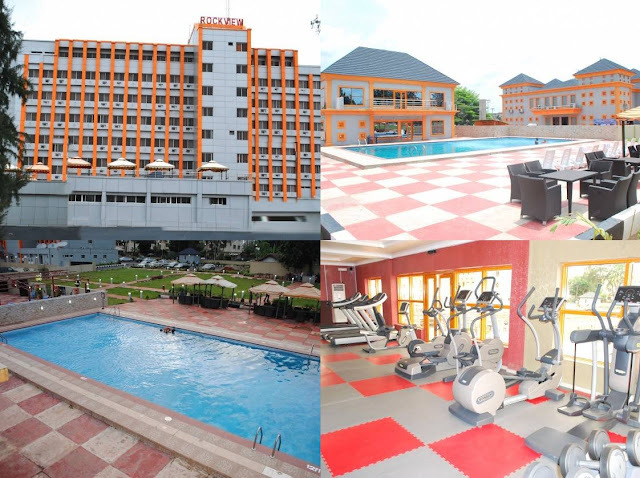 The average cost for a night in the Imo Concorde Hotel is ₦22,500. The Rockview Hotel is a 4-star rated hotel, and it is sited just close to the Government House. With an awesome exterior, it also has a lot of diverse rooms for a bit pricey budget. They have a pool with bar, gym, bar, well-spaced event halls, buffet facilities and a spacious sit out for your pleasure. Their rooms are fully equipped with free wireless internet service, air conditioner, flat screen tvs, international and local cable channels, wardrobes, refrigerators and much more. The average cost for a night in the Rockview Hotel is ₦23,000. Immaculate Royal International Hotel is a 4-Star hotel situated at Plot 7 Port Harcourt Road, off Imo House of Assembly, Owerri, Imo State. It is directly opposite to the Imo State House of Assembly and a 20-minute drive from the Nekede Gardens and Zoo and 45-minute drive from the Oguta Lake. There are different kinds of room in the hotel based on the customers' preference, the Senatorial, Ambassadorial, Diplomatic and Standard, with each furnished to the highest standard. The rooms all have WiFi internet access, a coffee/tea maker, a TV with satellite reception, a wardrobe, an air conditioner, a telephone and an en-suite bathroom. The hotel has an onset restaurant which serves guests with a variety of meals and drinks. Wit its Olympic-size outdoor pool, guests can enjoy their swimming sessions to the fullest. The security of the hotel guests and their goods is guaranteed because the hotel is fenced properly with good security guards, and safety deposit boxes, luggage rooms and safes. Other services that are offered in the hotel include laundry/dry cleaning services, ironing, 24-hour room service and a concierge. An onsite ATM is also in the hotel for easy withdrawal of cash. → Oguta Lake Holiday Resort with Golf course, cruise boat services, Golf club etc. 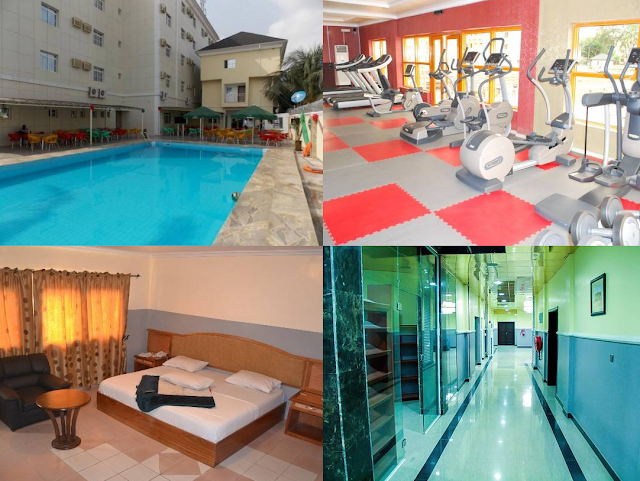 The average cost for a night in the Rockview Hotel is ₦19,700. 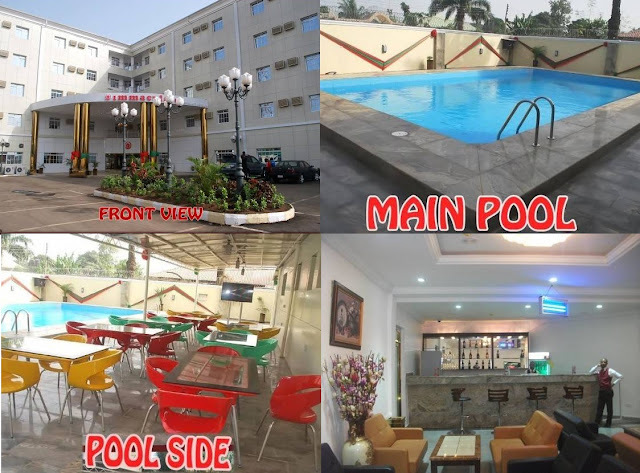 The Full Moon Hotel is a 4-star hotel and it is located at H1, Full Moon Avenue, off Akanchawa, road by Nekede junction, housing area C in New Owerri. With over 70 rooms classified into Pent House Double, Pent House Single, Executive, Deluxe and Premiere. The rooms are well equipped with flat-screen tvs and multi-channel satellite, Wifi internet connection, air conditioning, refrigerator, ensuite bathroom with stand-in shower, hair dryer and toiletries, mini bar in the room, cribs on demand, telephone and daily newspapers supplies. They also have CCTV facilities for their advanced security and adequate parking space. There is a swimming pool, restaurants, elevators, bar and a well-equipped gym. This is the list of all the hotels in Owerri and their reviews. We removed things like Air conditioners, bars, swimming pools, ATMs and POS because most of the hotels in the list have them. 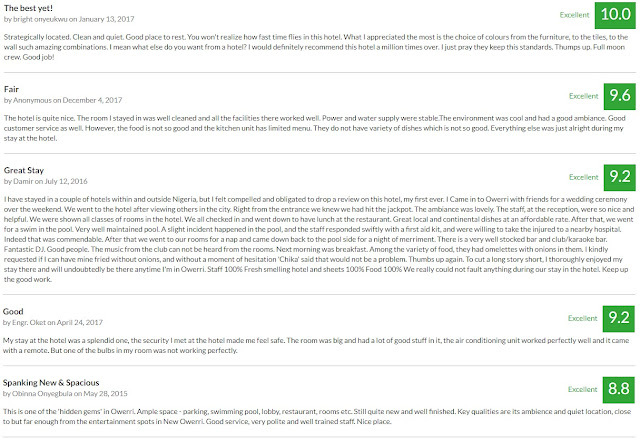 For a comprehensive list and review, please refer to this page.